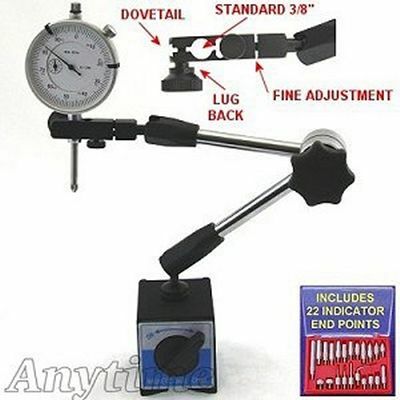 Professional Quality Precision Tool Set! Magnetic Base: Gages easily set up into desired position with unique 3-dimensional central locking hydraulic mechanism. Fine adjustment. Accepts all types of indicators - 3/8" stem, Lug Back, and Dovetail. Turning knob to release all degrees of freedom joints. Point Set: Choose the right end for your indicator to fit the surface from this 22 pc set.